When I try to resolve issues and conflicts, I see a clear gap between expectations of both parties. Most of the times, expectations are not made clear. In professional companies, you make the expectations clear in terms of KRAs & results. But when it comes to the appraisal, managers say, results are ok but still employee needs to improve. There are certain points discussed, which employees are not even heard in past. There can be different stages in expectation management. It can be either in organization and even family. Imagine when new daughter–in-law comes in home, how expectations are set and managed. It is totally depend upon the culture and values of the family. The occurrence of the conflict is in mostly in expectation management. The vital factor is in communication and interpersonal skills. But it also carries a perception. I have seen one organization where the termination of employees was a common phenomenon. When we went into the details, it was the only one person who was whimsical. People were confused about his expectations. If somebody performs, he would object on something different. Moreever expectations are the reasons behind any conflict. When there are stated expectations in the form of KRAs, Job Descriptions and Competencies, you can avoid the conflict at certain level. But it is upto the manager how he makes it more objective. There are lots of factors where it is very difficult to make the behavioural outcome in objective term and hence it should be related to some results. The results can be the outcome of certain behavioural expectations. Companies try to make it objective by competency mapping and assessment. But I really have a doubt how seriously it is done. 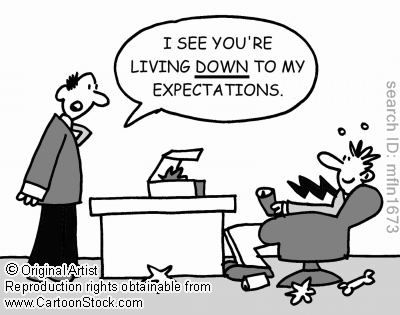 It is very difficult to manage the perceived expectations. Employees also have the perceived expectations from the management; however superior’s perceived expectations are also important to understand. At specific level it is perceived that the next person is matured enough and he understands well the perceived expectations. Everything can not be documented under KRAs, JDs etc. There are certain accountabilities which run between the lines in JDs. To a large extent, bosses declare that projects/objects have either succeeded or failed based on whether it met their expectations. Few responsibilities fail, in an absolute sense — they simply fail to meet individual expectations. Awareness of an employee plays important role in success. You are expected to be smart enough to understand dimensions of human behaviour and thereby perceived expectations also. Vinod Bidwaik is the seasoned HR professional working with DSM Eng. Plastics India as the HR Head for India operations. He has the wide experience in Indian and MNCs like M&M, Endurance Group, Semperit Group and Sakaal Group on senior level positions. This entry was posted in Human Resource. Bookmark the permalink.